DALLAS -- Dallas County commissioners have decided to not issue a disaster declaration after Ebola has left a man from Liberia dead and two nurses infected. Commissioners held an emergency meeting Thursday afternoon, but took no action on the proposal. Instead, commissioners said they planned to provide written agreements to the 75 health care workers being monitored for Ebola, asking them to avoid public transportation and places. Liberian patient Thomas Eric Duncan was diagnosed while visiting Dallas. He died Oct. 8 at Texas Health Presbyterian Hospital. 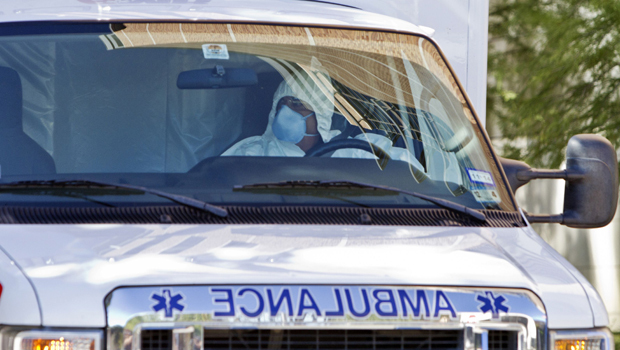 Two nurses who treated Duncan contracted Ebola and remained hospitalized Thursday. The revelation that the second nurse was cleared to fly the day before her diagnosis raised new alarms as leaders of the nation's public health system prepared to defend their efforts to contain the deadly virus before a congressional hearing Thursday. Centers for Disease Control and Prevention Director Tom Frieden said that nurse Amber Joy Vinson never should have been allowed to fly on a commercial jetliner because she had been exposed to the virus while caring for Duncan. Vinson was being monitored more closely since another nurse, Nina Pham, also involved in Duncan's care, was diagnosed with Ebola. Officials said that Pham was scheduled to be moved Thursday from Texas Health Presbyterian to the National Institutes of Health in Bethesda, Maryland. Still, a CDC official cleared Vinson to board the Frontier Airlines flight from Cleveland to the Dallas area. Her reported temperature - 99.5 degrees - was below the threshold set by the agency and she had no symptoms, according to agency spokesman David Daigle. Vinson was diagnosed with Ebola a day after the flight, news that sent airline stocks falling amid fears it could dissuade people from flying. Losses between 5 percent and 8 percent were recorded before shares recovered in afternoon trading. Dr. LaPook on next steps to contain Ebola in U.S.
Vinson was transferred to Atlanta's Emory University Hospital Wednesday for ongoing treatment after being diagnosed with Ebola. She was helped from an ambulance onto a waiting plane by four medical workers in the now-familiar white hazmat suits, but there was one other person on the tarmac. According to CBS Dallas station KTVT-TV, questions about who a man wearing plainclothes and carrying a clipboard might be poured in. According to KTVT-TV, officials at both the ambulance company that transported Vinson to Dallas Love Field Airport for the flight and Emory University Hospital said the man was not one of their staff. That, according to the report, makes it likely that the mystery man, who boarded the plane after all the others and reemerged on the tarmac in Atlanta, was the Centers for Disease Control and Prevention officer overseeing the transfer. Contacted by KTVT-TV, a CDC official in Dallas didn't confirm the man with the clipboard was a member of the national agency's staff, but the official did tell the station it appeared he had maintained a safe distance from Vinson while working on the tarmacs at both ends. Meanwhile, a Cleveland area school has taken a series of precautions after learning that one of its teachers may have come in contact with Vinson. In written statement, the Cleveland Metropolitan School District said it was informed late Wednesday night that "a teacher who works at Cranwood School may have come in contact with a person diagnosed with the Ebola virus." The Summit County Public Health medical director said at least seven people in northeast Ohio are quarantined and being monitored because they had contact with Vinson. Federal health officials who say they know how to shut down the disease within the U.S. were being called to testify in what was looming as a combative hearing by a House oversight panel on Capitol Hill. Is public confidence in U.S. response to Ebola shrinking? In prepared testimony, Dr. Anthony Fauci, director of the Institute of Allergy and Infectious Diseases of NIH, said that the death of a Liberian man and the infections of the two Dallas nurses and a nurse in Spain "intensify our concerns about this global health threat." He said two Ebola vaccine candidates were undergoing a first phase of human clinical testing this fall. But he cautioned that scientists were still in the early stages of understanding how Ebola infection can be treated and prevented. Spain's government is wrestling with similar questions. The condition of a nursing assistant infected with Ebola at a Madrid hospital appeared to be improving, but a person who came in contact with her before she was hospitalized developed a fever and was being tested for the virus Thursday. That person is not a health care worker, a Spanish Health Ministry spokesman said. To this point, only hospital workers - the Madrid nursing assistant and the two nurses in Dallas - are known to have contracted Ebola outside West Africa in this outbreak, which is spreading out of control in Liberia, Sierra Leone and Guinea. Amid increasing anxiety over Ebola, customs and health officials at airports in Chicago, Atlanta, the Washington suburbs and Newark, New Jersey, were scheduled Thursday to start taking the temperatures of passengers from the three hardest-hit West African countries Thursday. The screenings, using no-touch thermometers, started Saturday at New York's Kennedy International Airport. President Obama directed his administration to respond in a "much more aggressive way" to oversee the cases in Dallas, Texas, and ensure the lessons learned there are transmitted to hospitals and clinics across the country. For the second day in a row he canceled out-of-town trips Thursday to stay in Washington and monitor the Ebola response. Even as Mr. Obama sought to calm new fears about Ebola in the U.S., he cautioned against letting them overshadow the far more urgent crisis unfolding in West Africa, where Ebola has killed more than 4,000. Underscoring his emphasis on international action, Mr. Obama called European leaders Wednesday to discuss better coordination in the fight against Ebola in the countries of Sierra Leone, Liberia and Guinea and to issue a call for more money and personnel to "to bend the curve of the epidemic." British Prime Minister David Cameron's office said he offered to consult with the Italians to add treatment beds in Sierra Leone. On Thursday, Chinese President Xi Jinping pledged continued support for the fight against Ebola in West Africa, but made no specific new aid offers. China last month pledged $33 million in assistance and dispatched doctors and medical supplies. And France said that on Saturday, it will begin screening passengers who arrive at Paris' Charles de Gaulle airport on the once-daily flight from Guinea's capital.